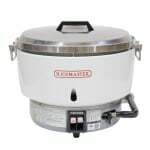 The Town RM-55P-R commercial rice cooker is heated by propane gas and connects to an easy-to-use rear feed. This cooker is not only made for rice; it can cook other foods as well. A bimetallic temperature sensor is mounted in the base of the cooker to ensure accurate heating and temperature control. The plated steel drop handles and aluminum construction make the cooker durable to resist daily use. Operating the cooker is simple since there are only two buttons. The Town RM-55P-R commercial rice cooker has a capacity of 55 cups and cooks rice in 27 minutes.